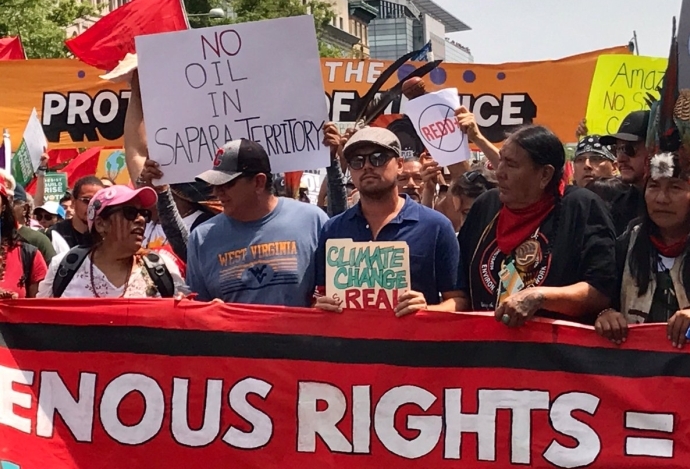 Leonardo DiCaprio was spotted front and center supporting Indigenous Communities with a sign that read "Climate Change is Real." Early Saturday morning thousands of people met up in Washington, D.C. to rally for the planet at the People's Climate March. The first People's Climate March took place in 2014 in New York City on the eve of the United Nations Climate Summit. People came together Saturday, on President Donald Trump's 100th Day in office, to urge him and other lawmakers to take action on the environment. While the main march is happening in Washington, D.C., there are satellite marches happening worldwide. There is a live feed of the D.C. march available to stream online if you can't make it to a march but want to follow the progress. The metro system in D.C. was crowded Saturday morning as people made their way to the Capitol meeting area. Participants started to meet at 9 a.m. in D.C., lining up around 11 a.m., to start marching at 12:30 p.m. The plan was to begin the march and assemble in front of the Capitol Building before marching to the White House to loudly demand action on climate change. The weather in D.C. was forecasted to reach 92 degrees Saturday, the hottest April 29 D.C. has ever seen is 91 degrees, meaning the day could set an ironic temperature record. Meanwhile, in Denver, it was snowing but people still showed up to march. Responses to "People's Climate March: Leonardo DiCaprio joins Natives to defend indigenous rights"